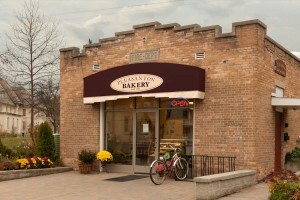 Nestled next to the piazza at The Village at Grand Traverse Commons, sits a small bakery with a big heart. Eschewing the “whitening, yeasting and sugaring” of the bread industry, Gerard Grabowski and his team of artisan bakers at Pleasanton Brick Oven Bakery craft bread the old fashioned way—with naturally leavened dough, baked in a wood fired brick oven. A small bakery with a big heart. The original bakery, started in a small kitchen in 1993, had a mission to wholesale healthy, wholesome bread to Traverse City’s local food co-op and farmers market. “We started small, with big dreams and an ever growing following,” he quips. In 2008, Gerard and his wife Jan saw a brick-n-mortar opportunity among the renovation and redevelopment of dozens of historic buildings formerly known as the Traverse City State Hospital. Smack dab in the middle sat a small but sturdy brick building which once housed the asylum’s fire station—perfect for a community bakery, Gerard thought. The renovation of the space came with adding a custom-built brick oven out the back, a small retail bakery case in front, and as much kitchen space as possible in between. At the hub of the bakery’s kitchen sits a butcher block prep table from the Michigan Maple Block Company. Other tools of the trade surround the table—a baker’s scale, cooling racks, and long well worn wooden paddle for feeding and pulling loaves from the hearth—each with its purpose, each in its place. 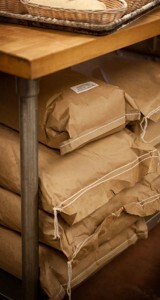 Stacks of flour bags occupy the under shelf of another Michigan Maple Block table nearby. 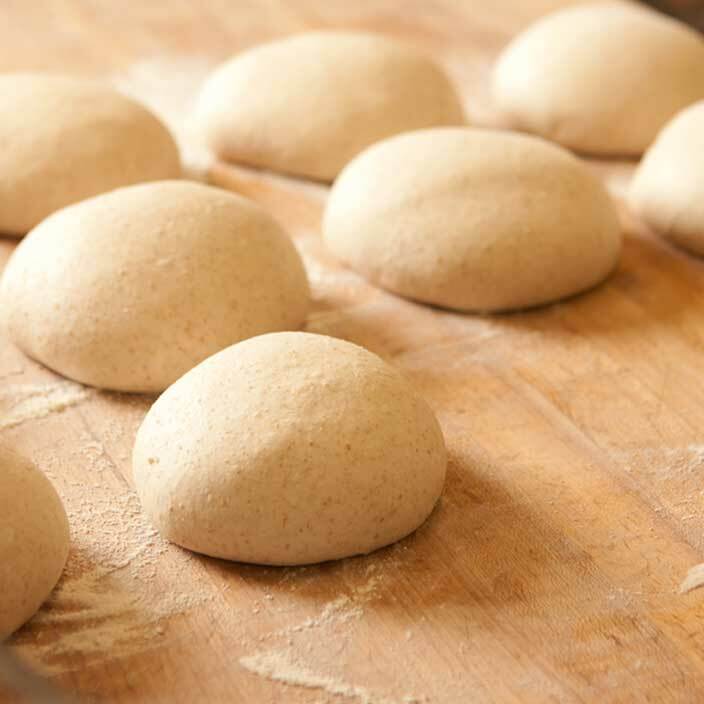 It’s that philosophy—for the love of local, for the love of the craft—that has proven to be the right recipe for Pleasanton Brick Oven Bakery. Today, almost twenty years into the trade, their menu has expanded from exclusively breads to a bounty of brick oven favorites—from pizzas and pies to the celebrated, perfectly not-too-sweet, unexpectedly healthy, Pleasanton cookie. 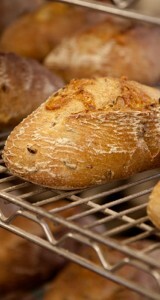 A half-pound of fresh Parmesan cheese and a lot of love goes into each loaf of the Parmesan Olive Herb bread. Pleasanton offers savory, too. Like the Parmesan Olive Herb bread with a half-pound of fresh Parmesan cheese baked into every loaf. A hot-off-the-hearth hunk of this will have you asking why you only walked out with one loaf. Sweet. Savory. Well-deserved success. Gerard remains steadfast in his one-man march against the mass production murder of the age-old craft of bread making. He and his team of artisans fight the good fight to bring back the neighborhood bakery. And he has flour on his hands to prove it. Click here to learn more about Pleasanton Brick Oven Bakery.